It is not even November, the month for procrastinating on writing a novel (also known as NaNoWriMo), and I am already taking up the habit of doing everything but what needs to be done that is writing related! 1) Done a full revision of BoG even though I said I was going to shelve it for a while and work on Helen instead. 2) Built an author website. 6) Read up on Bonnie and Clyde (obviously) who may or may not be tangentially related to my NaNoWriMo novel, but more than likely won't really make it in because this book is already going to be a giant mess even without adding in that whole next level of complication. Hey Everyone! I have some great news! I spent the entire day yesterday working on building myself an author website, and it is now LIVE for your perusal! Let me know if there is anything I'm missing, yeah? I think I got the basic basics down. I'd like to put some kind of mythology related background on it maybe one of theses days, but I have to find something appropriate first. I've been thinking about Bonnie and Clyde for a few weeks now, mulling them over in my mind as historical figures and the larger than life characters they became, afterwards. I have two characters who very, very, very much fit into a Bonnie and Clyde mold. So I started doing research-- and as usual, this close to NaNoWriMo, I started with Wikipedia. NEVER ever my only research tool, but good for an overview, I find, for a topic I know very little about, and the first thing I absolutely had to know about Bonnie and Clyde was when they died. As it turns out, the date of their death fits perfectly within the period I'm working inside for my NaNo project: May, 23, 1934. Bonnie and Clyde were gunned down in their car by a posse of law enforcement officials who had grouped together for the purpose of catching them. Clyde, it appears, fell into the category of shoot on sight, but Bonnie, who had never killed anyone, was another matter. I suppose I can understand why the officers elected to shoot first and ask questions later, but I'm not sure I can make sense of the sheer number of shots fired, or the manner in which the whole debacle was treated. I can not, for example, understand how any governing body felt it was acceptable to give away Bonnie and Clyde's possessions to the posse that hunted them down, instead of returning their personal effects to their respective families. I can not, for example, understand how people mobbed the scene and attempted to cut off body parts for souvenirs after Bonnie and Clyde were killed. I can not understand why multiple head wounds, and even more multiple body shots were necessary to kill a woman who had never killed anyone herself, even if she was an accomplice to Clyde's criminal acts. I can not understand why, criminal though they certainly were, we chose as a nation to deny Bonnie and Clyde a trial by jury and the basic right of innocent until proven guilty. Not to say that there is any doubt as to their guilt, but I'm flabbergasted by the contradiction between, on the one hand, treating them as romanticized folk anti-heroes, famous and larger than life, superhuman, and on the other hand, something to be exterminated. This dichotomy between celebration and disvaluation of what still is, no matter what their sins, human life, kind of boggles my mind. I wonder if what captures our attention and sympathy in regard to Bonnie and Clyde is not that they were criminals, but that the account of their deaths seems just as criminal as the acts for which Bonnie and Clyde themselves were summarily executed. Couldn't Bonnie and Clyde have been shot to injure and incapacitate, rather than wholesale slaughter, so that they might be tried and convicted? Or if Clyde was too dangerous to be kept alive, what reason did they have for shooting Bonnie a reported 26 times? Bonnie's character itself is kind of fascinating, too, in that she seemed to be an accomplice, but not so much of one as to kill herself, and yet, she was still painted as a murderer. I kind of wonder if part of the reason she was gunned down with Clyde was because she was such an aberration. Perhaps society did not want a woman who ran around with a bunch of bank robbers, glorifying a life of unmarried and illicit behaviors, to be let off? Was Bonnie herself a threat to the status quo which kept women, at that time, still to a large degree under the control of their husbands or fathers? Mia pointed me to this book, My Life With Bonnie and Clyde, on Amazon. I might have to go see if there's a copy at the library, or order it and see what Clyde's sister-in-law (another member of the gang) felt about all this. From the excerpts I read, there seems to be a certain level of desperation to that time in her life. And for all of the terrible things they did, a very real sense of family loyalty and affection among them. So why couldn't we be at least as human in apprehending them? I'm sorry to tell you guys that the MUNG has come to my household, and writing this blogpost telling you we are ill is the best I can offer at the moment. It seems that I caught something, then gave it to El Husband. Neither one of us is thrilled with the situation. I have however been able to do some revision work, in spite of the mung, so I'm feeling pretty good about THAT at least. It's kept me hopping though, and so today's blogpost must suffer for that success. You will all be happy to know, also, that I ordered the next two Hunger Games books. Soon, I will be among those who have read the entire trilogy, and you can all speak freely in my presence. Please send the get well soon vibes so that I'm healthy in time for the NaNo kick off party in my region on Saturday! I don't want to miss it again this year! “Skál!" Balder said, raising his mug. Thor smiled and knocked his cup against his brother's. The mead splashed over the lip, trickling between his fingers. "Skál!" He quaffed his drink in one long draught and slammed it back to the tabletop just a moment before Balder. A cheer went up from the men around them, golden coins raining against the wood and stone. If there was any god in Asgard capable of out drinking him, Balder stood the fairest chance, though even then, only if Thor was already well into his cups. But in the relief after battle, no one had noted who had begun drinking first and the wagering had been fierce. "More mead!" Balder called, and Thor laughed. "Bravery has little to do with it, brother. Mead!" He called again, and pulled one of the Valkyries into his lap. Kára shoved him backward off the bench before filling their mugs, winking at Thor. "Your wife sends word you must be sober enough to walk yourself to your hall, Thor, or she will find another god to take to her bed." Thor grinned. "Balder will be drunk beneath the table long before my limbs are affected by my own mead. She need not go looking for any other." "Ha!" Loki said. "And what other god can give her so grand a skáli as Thor!" The gods roared with laughter, banging their fists and mugs on the table. "When will you build a proper hall, Thor?" Bragi asked. While the other gods had built immense halls, shining with gold and silver roofs, Thor had not improved upon the small cottage he shared with Sif since he had built it for shelter while he and Odin had raised Asgard from the earth. It had only two rooms, and a single hearth. Not that Thor had spent two days together at home since the war had begun. He grimaced. "Surely you can not keep Sif in that hovel for an entire cycle!" "Tomorrow Odin can send you to fight frost giants, and I will build a proper skáli for my bride." Thor raised his cup over the laughter of the gods. Bragi was god of poetry, and served better as messenger than warrior. "To victory!" "To victory!" Balder called, struggling up and back to his seat. "And its rewards!" "Skál!" the other gods shouted. Thor drank, and drank again. And the third time that Kára came to refill their cups, Balder did not rise from the floor where she had knocked him for his cheek. The others would see that he found his bed, as they had every night their champions had returned from the fighting. Thor rose and made his way back home to his cottage on feet still steady, pleased to find his wife waiting at the door. He took her in his arms, staring into her honeyed eyes, more brilliant than any amber. She laughed and framed his face in her hands, pressing her forehead to his. "Home at last. Though I suppose I should be angry that you only come to me after you've had your toasts and your wine." "That I might come to you with nothing else on my mind, the grimness of battle left behind," he said, winding his fingers through her golden hair. She smelled of sunlight and fields of wheat, her skin beneath his calloused fingers smoother than water. "I promise you, I am better than mead for forgetting." "Skál," he murmured against her lips. And then he drank deep. Recently a cousin of mine was asking me about Norse mythology, picking my brain for good sources. In particular he asked me if there were any good images of a Norse god reaching out to a human follower. I imagine he was thinking along the lines of Michaelangelo's Sistine Chapel, with Adam reaching for God, or if he wasn't thinking it, I sure was. Then it struck me. Do we EVER see the Norse gods really reaching out to their (human) people, engaging with them in an open and hands on way? Now, I'll admit I haven't read all the sagas (yet) but I can't think of a single instance in which Odin or any other Norse god employs real godly power or hoo doo while engaging with a human. In fact, thinking back on the Saga of the Volsungs in particular, I don't recall a mention of anything that might be a religious practice at all, unless you count the use of runes and potions-- but they don't ever seem to invoke a god. People seem to be acting very much independently of the gods above them, acting by and through their own human powers. And maybe that's all it is: the sagas as a triumph of man without need of the gods or godly interference, because certainly the Norse people were of a fiercely independent nature. But if they were so intent upon rejecting the gods themselves, why hold on so tightly to such a rich mythology at all? Why give Odin ANY role in the story? So often we hear of some saga hero being a distant descendant of Odin somehow, but never really the details of the circumstances resulting in the bloodline. And Odin himself keeps to the fringe, the margin of the stories. When he does play a role, it is usual a suggestion, or a bit of shared wisdom more than anything else, coming from a disguised man who may or may not be recognized for the god he is at all. The kennings themselves contribute to this marginalization even further. If a reader does not KNOW the common ways in which a god might be addressed without calling him by name, they're likely to miss the god's part in the story altogether. It all just becomes so much window dressing. Now, in the one respect, these kennings are a poetic device, and probably were used in the same way that Homer inserted repetitive stock phrases into the Iliad like "owl-eyed Athena" or "white-armed Hera" but what if they served another purpose as well? What if Odin's marginalization in these sagas and stories was a direct result of the Christianization of the Norse people? I wonder if in order to keep their gods, their stories and histories, their cultural inheritance, Odin (and his ilk) had to be removed and made a lesser character in the recorded texts, the kennings added as further disguise for the pagan elements of the story. What if the character of Odin as the wandering old man, sticking to the fringe of society and rarely interacting in any large way, is just the result of trying to preserve the sagas and myths in a form which would not result in condemnation by the church and those who took seriously the idea that the Norse gods were devils and demonspawn? The Church certainly did not hesitate to wipe out writings of other cultures they found offensively pagan whenever they thought they could get away with it. I have no real proof of this as yet, but the feeling in my gut that this is not out of the realm of possibility. Call it food for thought, if you will. And now I'm REALLY curious-- what do you think? And do you know of any stories where Odin takes a larger role in engaging with his people? Norse Mythologists, Please! I would love to hear your thoughts on this! If you missed part one, don't worry, it's sitting just below this post on the main page, and it covers the FIRST creation story of the Norse Myths: the creation of the gods themselves. I am, uh, somewhat overly familiar with the Christian Genesis at this juncture, and if I ever have to see the creation story again it will be too soon. But for the purposes of this post (covering the Norse Adam and Eve), I figure a little bit of contrast might be nice, so I'll make the sacrifice of revisiting it for all of you! First, as previously mentioned, Adam and Eve (image from wiki commons by Peter Paul Rubens*) are made twice. Once, together and last after the creation of all other life, unnamed, and a second time as Adam and Eve, with Adam having been made first, all other animals created for the purpose of his companionship, and Eve finally made last from Adam's own body. (do I need to quote? okay, okay, fine. I'll quote**. Under the cut.) The Norse on the other hand, divide their creation twice in a different way, they have a creation/spawning of the gods themselves followed by the creation story of the ancestors of man (and, uhm, giants. They also have a flood by the way, but this post is already way too long). Now it is said that when he [Ymir] slept, a sweat came upon him, and there grew under his left hand a man and a woman, and one of his feet begat a son with the other; and thus the races are come; these are the Rime-Giants. Reading direct from the source, it seems unclear to me if the first man and woman sprung from Ymir's armpit sweat (seriously) were giant and giantess or simply men. The addition of "these are the Rime-Giants" I suppose is meant to clarify that issue. But it is still the creation of A people (enemies of the Aesir and to a lesser extent, man), if not OUR people. And maybe it doesn't qualify completely as a creation story, since they're more spawned than MADE. But there is no mistaking the second account, which is far more vivid and detailed in its description (much like the second Genesis story). 'When the sons of Borr [Odin, Vili, and Ve] were walking along the sea-strand, they found two trees, and took up the trees and shaped men of them: the first gave them spirit and life; the second, wit and feeling; the third, form, speech, hearing, and sight. They gave them clothing and names: the male was called Askr, and the female Embla, and of them was mankind begotten, which received a dwelling-place under Midgard. It's clear Snorri took from this previous accounting for his own version in the Prose Edda. I can't tell you why he changes the names of the gods involved though. It's entirely possible he had a different source to work from that we no longer have today and chose those names within it as more correct for some reason, though the Prose Edda quotes already quite a bit from the Poetic Edda. What's fascinating to me, in regard to the Norse creation myth, is that there are two distinct forms of creation related. The spontaneous-big-bang-spawning, and then the later physical creation of another race involving the gifting of spirit. The other fascinating part of the whole thing is how much more neatly the Norse creation stories fit into our modern and scientific view of how the world came into being (And the Norse Mythology Blog has an interesting discussion about THAT as well, for further reading). It's kind of fun to see the parallels, but I have to admit-- reading Norse Mythology requires something of a sound stomach. Over all I think I prefer Noah and the Ark to an entire race of giants being drowned in blood. *Incidentally, Peter Paul Rubens is the only painter I've come across who paints Adam and Eve in an even remotely attractive manner, imho. This particular painting appeals to me even more because it almost seems as though Adam is the one engaging in the seduction. 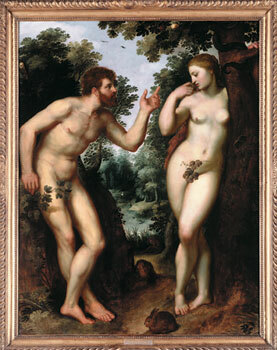 His Garden of Eden with Jan Brueghel is my twitter background, and you might recognize my blog and twitter avatar as being taken from this Adam and Eve painting. **really, personally, not impressed with the King James Version. But I'm even less impressed with NIV, and other than the copy of the Tanakh on my bookshelf, I'm not sure what the best translation of the Hebrew would be to use, and don't want to give you something inferior I got off google. 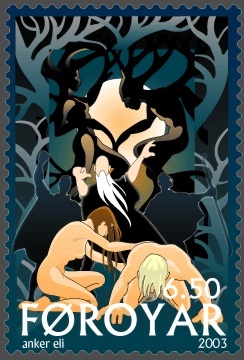 Tomorrow is part two of the Norse Creation Myth post series, so be sure to stop in for that, because we're actually covering Askr and Embla, who were featured on that very lovely postage stamp that I wish I could turn into a poster and hang on my wall. BUT IN THE MEANTIME, if you like, you can check out my Guest Post for Ms. Mia over Yonder on her blog! There is some #ThorLove, I'm not going to lie. Or at least there is some Thor-Hating-on-Zombies, which he is prone to do from time to time. I really don't know what gets into him. If you think that I'm funny (sometimes), you will quickly realize that my comic writing does not have a patch on Mia's sense of the hilarious, so you should definitely go check out her blog regardless of whether or not you want to hear about Thor's Conspiracy Theories of Zombies and Glitter. Yes, I did just link to the same post twice. You know what? Because you really need to go to Mia's blog and become one of her followers, AT ONCE! Then come back here tomorrow for more (serious) Norse stuff! Most of you, I'm sure, are familiar with the Creation story of the Book of Genesis. I always found it kind of odd, this dual creation of man (and odder still the way Christianity places so much more emphasis on that second creation story which "makes" woman subservient to man). Lately as I perused my Norse texts, I began thinking about the Norse creation story, and its Adam and Eve: Ask(r) and Embla**. And like the Christian mythos, there are two stories of creation (albeit not exactly parallel but much more sensible if you ask me). First we are told of how the gods themselves came into being, and then, secondly, the ancestors of man. Since this post kind of exploded in length, I'm splitting it in half, and today we're going to cover the creation of the gods! Now Norse creation is not quite so tidy as the Christian, if only because there are a heck of a lot more intelligences being created: Giants, Gods, Dwarfs, Elves, humans, etc. In my last post we talked a little bit about Ymir and Buri's descendents leading to Odin and the creation of Midgard from Ymir's body. (Gives new meaning to the expression "over my dead body" doesn't it?) Ymir himself is sprung from the great melt when Múspellheim and Niflheim met after the big bang, and like Audumla the Cow, his creation is somewhat spontaneous, without credit to any other intelligence. "Straightway after the rime dripped, there sprang from it the cow called Audumla; four streams of milk ran from her udders, and she nourished Ymir." Then asked Gangleri: "Wherewithal was the cow nourished?" And Hárr made answer: "She licked the ice-blocks, which were salty; and the first day that she licked the blocks, there came forth from the blocks in the evening a man's hair; the second day, a man's head; the third day the whole man was there. He is named Búri: he was fair of feature, great and mighty. I suppose you could say that the gods themselves (Buri being the father of Bor who is the father of Odin) were unearthed after the big bang, as we might dig up fossils. Spontaneously made by the force of the explosion. It's also kind of interesting to note that all life so far has come from/risen out of the water, something that science today has determined to be absolutely essential to life and goes in search of on other planets today in the hope of finding other spontaneous life forms. It isn't really all that surprising that an ancient culture would find it essential as well, early man knew what it needed, and the Norse people made a very good living through mastery of the seas, but nowhere in the Christian Genesis does life seem quite so connected to water as we see in these myths. All of this creation, and we haven't even gotten to MAN yet. You see what I mean about not being quite so tidy? But don't worry, we're almost there. You'll get to see Askr and Embla in Part II!